SKU-LPTBK LIGHTER POUCH WITH THUMB NOTCH BLACK ZIPPO LIGHTER. 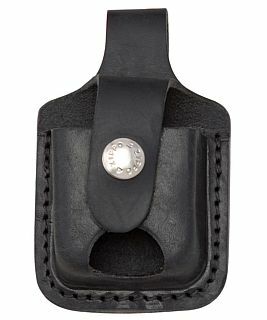 Zippo’s genuine leather black thumb notch lighter pouch has a stylish design, yet is easily accessible. Features of this lighter pouch include a thumb notch for easy removal of any Zippo windproof lighter, a wide leather loop that fits belts up to 2” wide, and holds any Zippo windproof lighter securely. Comes packaged in a black Zippo box.